Formal lawns and ornamental grasses have been cultivated and greatly admired as far back as the Renaissance period. Today, most homeowners have lawns, and many discover the pleasure of planting ornamental grasses. 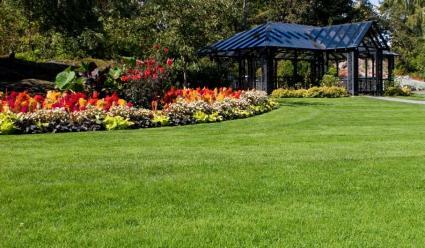 Whether your lawn is for family use or for show, get the information you need to make it beautiful at LoveToKnow Garden. Planting - Learn how to take care of your lawn from the start with instructions on laying sod and planting grass seed. Fertilizing - Find out the best time to fertilize your lawn, and get instructions on how to properly use lawn fertilizers. Care - Get tips, information, and instructions on how to care for your lawn at any time of year, no matter which type of lawn you have. Types of seed - Learn about specific types of grass seed, such as shade grass seed, as well as how to go about choosing the best seed for your needs. Choosing ornamentals - Learn about the many ornamental grasses that can add interest to your landscape design. Weed killers - Read up on different types of weed killer, such as products designed for specific weeds like dandelions, as well as products you can use safely around your pets. Tools - Seeds and fertilizers are only a few of the components that go into a great lawn. Learn about the various tools, like sod cutters and lawn mowers that can assist in making your lawn look great. With the right information, you'll be on your way to creating a lawn that's the talk of your neighborhood. Make use of the many informative articles on LoveToKnow Garden and create a lawn worthy of your efforts.